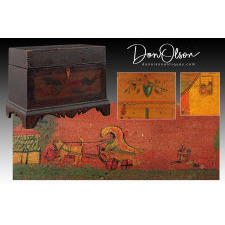 Antique Dealers Association of America - MINIATURE Lift Top Chest with Sophisticated Apron and Inner Folk Art Panels over Hidden Compartments. Northeast America, ca. 1800 to 1825. Pine or poplar, with untouched "sugary" varnish surface. Rich dark patina. Paint decorated with outer-case having black-over-red graining, flowers on the shaped and pierced apron and bracket feet, and red tulips on the front facade within a mustard reserve. The case conceals hidden compartments, one under a till above a decorated panel that slides up to reveal a tiny drawer. 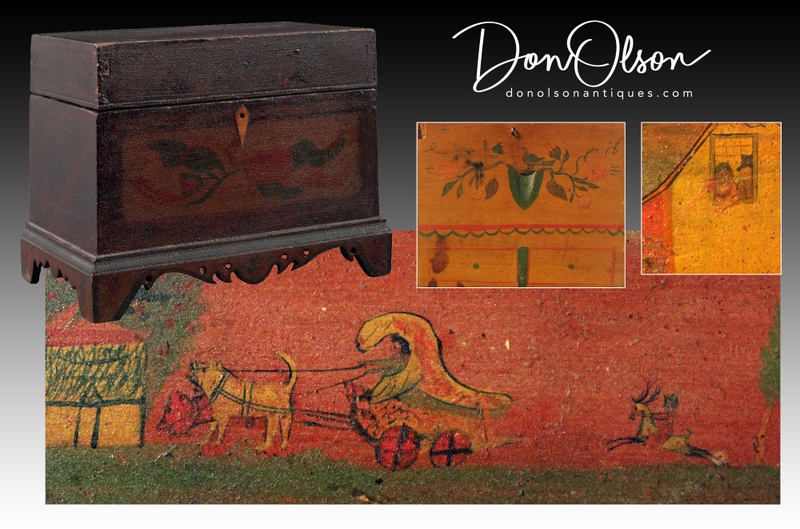 A hinged panel under the lid lifts to expose three compartments, the panel decorated on the outside with a folk art painting of a ship arriving at a wharf (note the woman and man in top hat at the window), the underside of the panel having another fanciful folk art painting of dogs pulling a chariot chased by a rider on stag. The remnant of a note includes the passage "May virtue and happiness." About 10 inches long x 7 3/4 tall x 5 1/4 deep. 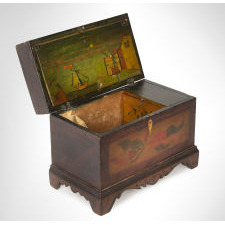 Provenance includes the "Tom and Carolyn Porter Collection" (Tom founder of Garths)..